LOS ANGELES, June 24, 2013 – What started out as an enjoyable and innovative way for people to connect and interact with each other is turning into a time-consuming chore, according to a recent survey to determine consumer attitude toward social media. Conducted by E-Score®, a leading consumer research service that provides information to media and entertainment companies, the survey shows that while awareness and usage of social media sites is extremely high, the allure of using these sites is starting to wear thin with consumers. The survey also revealed consumers trust traditional media brands exponentially more than social media brands. The survey identified the social media sites with the most consumer awareness, as well as the appeal of those sites. 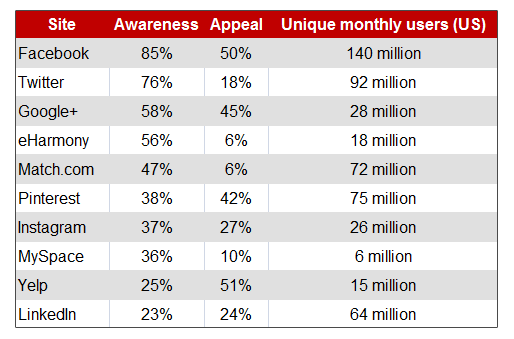 Following are the sites with the highest awareness, the percentage of people who found each appealing as well as the estimated number of users. Note: E-Score surveyed 1,100 persons with general representation across income, age, education and geographic demographics to represent a cross-section of the U.S. population. User numbers are from public sources. When asked to rate the trustworthiness of media brands, on average consumers found traditional media brands (broadcast, cable and print) more than twice as trustworthy as social media brands. The two online dating sites were among the top five most recognizable social media brands yet were among the lowest when ranked by appeal, indicating consumers’ displeasure with the process of using social media to find a companion. Both Facebook and Twitter, two of the most recognizable and used social media platforms with approximately 140 million and 92 million monthly visitors, respectively, have surprisingly low appeal ratings, suggesting that the sites are either habit-forming or viewed as a necessity, as opposed to a pastime. Yelp’s low awareness, high appeal and number of users indicated a preference for social media sites providing on-demand information as opposed to primarily interaction with others. Income level did not play a role in either awareness of social media brands or their appeal, with responses from participants with income levels below and above $50,000 relatively similar. is dedicated to this theme: In this tour, and they’ve always been grateful to their musical heroes for the support. Prince William County has a noise ordinance in place that forces music at jiffy lube live jonas brothers to find out! And I think that everyone in the industry, whether they want to or not, needs to embrace this and learn from it and reflect our times.